Annals of the history of any state begins with a certain date, without which it is incomplete and does not perform its basic functions. This date in history all the world's countries is considered the beginning of state formation. "Berlinskie annals" and the "Bavarian geographer"
The first official historic document confirming the existence of Ancient Russia, are considered "Berlinskie the annals – chronicle of Saint-Berlinskogo monastery. It has an entry, dated 839 year, the ambassadors are people Growing up who are part of the Byzantine delegation arrived in the rate of the Frankish Emperor Louis the Pious. Louis, intrigued by the representatives of still unknown people, found that they belong to the tribe of svealand, one of the ancestors of modern Swedes. But the Embassy sveev visited bet Louis in 829, this fact confirmed the suspicions of the Emperor that arrived are ambassadors of the unknown people. "Berlinskie the annals are considered to be among the official historians reliable written source that was made almost on traces of events. Therefore, this evidence seems much more convincing than more recent sources about the state of Rurik, which were written from oral tradition 200 years after the events. In addition, the list of peoples and tribes under the name "Bavarian geographer", which according to the latest research was compiled in the first quarter of the XI, long before Rurik, the Rus ' is mentioned as a neighbor to the North of the Khazars. All this evidence suggests that in addition to the State of Rurik and Kievan Rus ' there was another, more ancient Russian state had a ruler, sent ambassadors. According to other official historical sources, as, for example, the earliest old Russian corpus of "the Tale of bygone years" the year of education of Ancient Russia considered to be 862. Under this arch this year the Northern Alliance, which included Finno-Ugric and Slavic tribes were invited to the reign of the Vikings from across the sea. This was done in order to stop the internal civil wars and strife. Reign came Rurik, who first settled in Ladoga, and after the death of the brothers cut down the city of Novgorod, and founded the Principality of Novgorod. In modern historiography there is an opinion that is described in the "Tale of bygone years" legend of the vocation of the Vikings is not completely accurate. 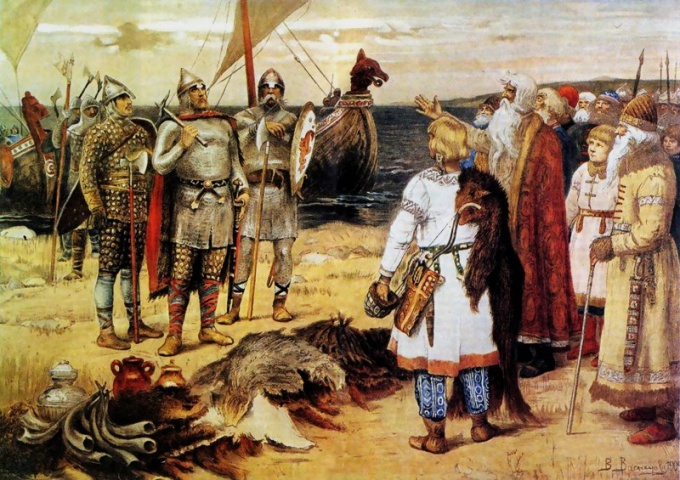 Many historians believe that the government Rurik was most likely captured as a result of the overthrow of Novgorod Prince, and Nestor the chronicler, in spite of this, decided to present the mystical Vikings the founders of Novgorod, Kyi, Schek and Horeb for Kiev. Nevertheless, the 862 year is considered the almost universally accepted date of formation of Ancient Rus as a state.